Comprised of over 3700 volunteers around the state, the Illinois Master Gardener program is a truly great program with a mission to help others learn to grow. To that end, each Unit, County, and person in the program provides individualized services to the needs and interests they see in their neck of the woods. From the Idea Garden at the Urbana-Champaign campus to the Monarch Madness event in Decatur, all of the many Master Gardener projects around the state are diverse and interesting! We love these programs, and I encourage you to learn more by contacting your local Extension office. However, my focus today are the bountiful community vegetable gardens Illinois Master Gardeners start or get involved with in nearly every unit of our state. These community gardens are grown to help teach, demonstrate, to provide opportunities for others and, increasingly, to provide food to local food pantries. I don't know how many pounds of produce Illinois Master Gardeners grow and donate to food pantries each year. I can only tell you about Unit 17, serving Dewitt, Macon and Piatt counties; but maybe I can secure that information at a later date. 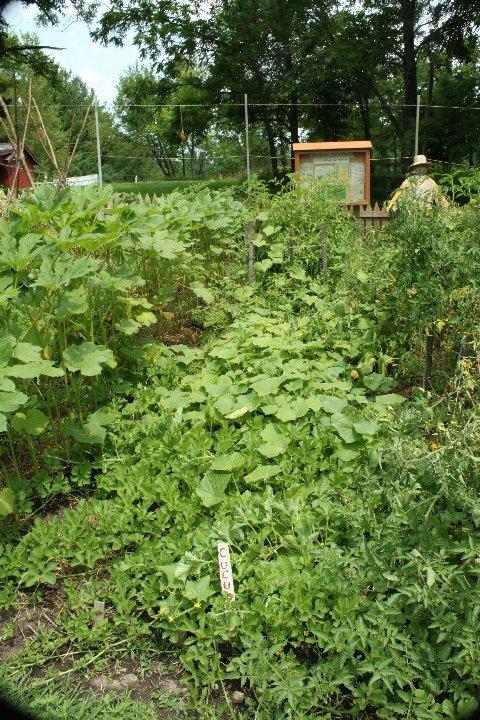 In our Unit 17, there are three very unique vegetable gardens grown and maintained by Master Gardeners. Though not all are strictly community based, they teach and share their bounty to others freely. On a modest scale, they are on track to contribute about 2000 pounds of fresh produce to area neighbors in need. Starting from oldest to newest, it is my pleasure to introduce them to you! Located at the historical Trobaugh- Good Homestead site at Rock Springs Conservation District, every year thousands of visitors visit this Master Gardener rendition of a typical family garden from the 1850's and 1860's era. Now considered heirloom vegetables of course, families of the day and so Master Gardeners now, grow varieties such as Red Cheese Peppers, Dwarf Taylor Pole Beans, Perkins Long Okra, and American Flag Leeks. Each year, over 400 pounds of this superb produce is donated to local food pantries, with the majority going to a large 'soup kitchen', where the food is added for tasty, nutritious supplements to the meal of the day. Started in 2016, this garden offers public plots. This is a growing project, with 8 gardens last year to 15 in 2017. Kirby Hospital maintains a plot to supplement their cafe menu, and of course the Master Gardeners have three plots where they are growing a wide assortment of vegetables and herbs. If visiting, information can be found by reading signs placed around the gardens; including what and why cover crops are utilized and how to deal with Japanese Beetles. In just one week, 47 pounds of produce was donated to an area food pantry; with much more to follow! This exciting new project started this year by offering the full Master Gardener course to a few of the inmates housed at this minimum security prison. Decatur Correctional Center had been trying to grow a garden for some years, with mixed results. Master Gardener classes were offered to 6 women, and they now work in the on-site greenhouse and gardens. As additional women take the class and graduate, they will rotate in to those work assignments. We hope and have already seen much success in this pilot garden partnership, including successful graduation of the 11 week course, women trained with the know how to grow and care for the gardens, instruction on leadership for women to help lead portions of classes to others, the desire and ability to join local Master Gardener groups in home counties on release, and much more. This garden was chosen to receive a $1000.00 grant to help buy supplies to grow food for a local food pantry. This brand new grant was only just received; so only one day's harvest of 49 pounds has been recorded so far. It's easy to find out more about the Illinois Master Gardener program and projects in your area too, go to http://web.extension.illinois.edu/state/findoffice.cfm and click on your county.